Background: Leptospirosis is a zoonotic disease which requires laboratory diagnosis for confirmation. Materials and Methods: In this study serum samples from adults with acute undifferentiated fever (duration ≤15 days) were tested for IgM antibodies to Leptospira by ELISA, PCR for rrs gene and loop-mediated isothermal amplification (LAMP) assay for LipL32 and LipL41. Results: Among the 150 sera tested, three were positive by PCR, LAMP and IgM ELISA/modified Faines' criteria, two by only PCR; seven only by LAMP assay and forty fulfilled modified Faine's criteria (illness clinically compatible and IgM ELISA positive for leptospirosis). Clinical correlation revealed renal compromise, low platelet count and severe jaundice were significantly related to leptospirosis (P < 0.05). Conclusion: This study suggests that LAMP assay could be useful for diagnosis of leptospirosis during the 1st week of illness whereas IgM ELISA forms the mainstay of diagnosis from the 2nd week onward. Further studies especially community based, comparing ELISA, PCR, LAMP, culture and microscopic agglutination test are required to evaluate the veracity of these findings. Background and Aim: Candida spp. have emerged as successful pathogens both in invasive and mucosal infections. C. albicans is the sixth cause of most common nosocomial infections according to studies by the Centers for Disease Control and Prevention. A shift toward non-albicans species has been reported. There is a dearth of knowledge regarding the virulence factors of Candida, especially from this part of India. The aim was to study the prevalence of Candida, speciate, and determine antifungal sensitivity along with the detection of in vitro production of phospholipases in 100 Candida isolates. Materials and Methods: A total of 100 Candida isolates from various clinical specimens were studied (February 1, 2015–May 31, 2015; 4 months). Speciation was done by conventional methods and antifungal drugs fluconazole and voriconazole tested. Phospholipase activity (Pz value) was determined. Results: Of the 100 Candida spp., 35% were C. albicans and 65% were nonalbicans Candida (NAC). Species spectrum was of the 100 isolates as follows: 35 were C. albicans, 17 Candida tropicalis, 6 Candida glabrata, 8 Candida guilliermondi, 1 Candida kefyr, 6 Candida krusei, 14 Candida parapsilosis, 2 Candida lusitaniae, and 1 Trichosporon and 10 Candida spp. (not speciated). 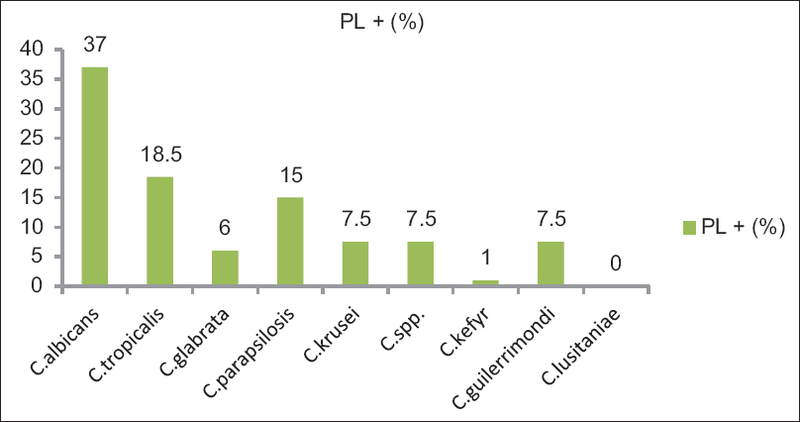 Phospholipase production was seen in 81 (81%) of the total isolates. The majority (63%) of phospholipase producers were NAC. Among NAC spp., the maximum phospholipase activity was seen in C. tropicalis (30%) and C. parapsilosis (24%). Of these, 60% of Candida was from patients admitted to the hospital. Sensitivity rates of C. albicans for fluconazole and voriconazole were 89.5% and 90.5%, respectively. Conclusion: Increasing usage of devices, total parenteral nutrition, broad-spectrum antibiotics, chemotherapies, and transplantation are factors contributing to the increase of candidal infections. Recent studies underline the increasing frequency of infections by NAC. The present study showcases the increased prevalence as well as virulence of NAC. In addition, early detection of virulence factors by Candida is useful in clinical decision-making. Background: Dengue and scrub typhus share similar clinical and epidemiological features, and are difficult to differentiate at initial presentation. Many places are endemic to both these infections where they comprise the majority of acute undifferentiated febrile illnesses. Materials and Methods: We aimed to develop a score that can differentiate scrub typhus from dengue. 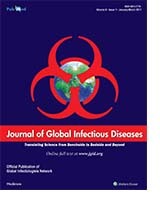 In this cross-sectional study, 188 cases of scrub typhus and 201 cases of dengue infection who presented to the emergency department or medicine outpatient clinic from September 2012 to April 2013 were included. Univariate followed by multivariate logistic regression analysis was performed to identify clinical features and laboratory results that were significantly different between the two groups. 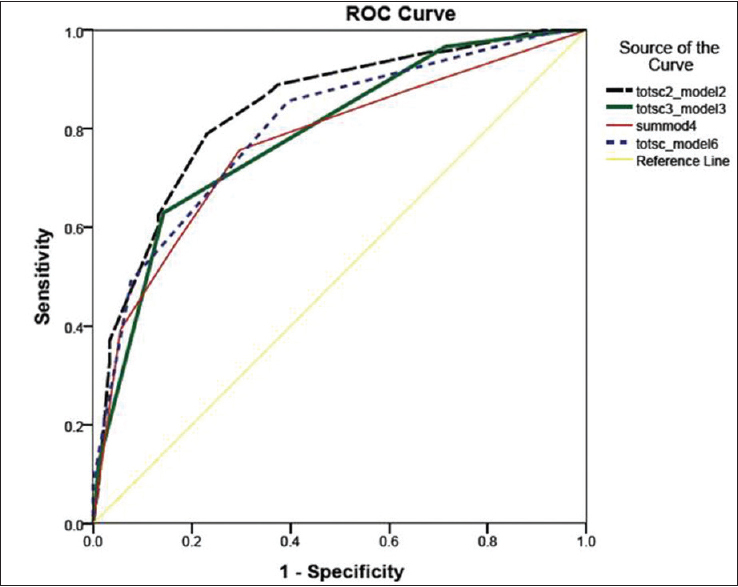 Each variable was assigned scores based on the strength of association and receiver operating characteristics area under the curve (ROC-AUC) was generated and compared. Six scoring models were explored to ascertain the model with the best fit. Results: Model 2 was developed using the following six variables: oxygen saturation (>90%, ≤90%), total white blood cell count (<4000, 4001–7000 and >7000 cells/cumm), hemoglobin (≤14 and >14 g/dL), total bilirubin (<2 and ≥2 mg/dL), serum glutamic oxaloacetic transaminase (>200 and ≥200 IU/dL), and altered sensorium (present or absent). Each variable was assigned scores based on its strength of association. The AUC-ROC curve (95% confidence interval) for model 2 was 0.84 (0.79–0.89). At the cut off score of 13, the sensitivity and specificity were 85% and 77% respectively, with a higher score favoring dengue. Conclusion: In areas of high burden of ST and dengue, model 2 (the “clinical score to differentiate scrub typhus and dengue fever”) is a simple and rapid clinical scoring system that may be used to differentiate scrub typhus and dengue at initial presentation. The dissemination of methicillin-resistant (MR) Staphylococcus aureus (SA) in community and health-care settings is of great concern and associated with high mortality and morbidity. Rapid detection of MRSA with short turnaround time can minimize the time to initiate appropriate therapy and further promote infection control. Early detection of MRSA directly from clinical samples is complicated by the frequent association of MRSA with methicillin-susceptible SA (MSSA) and coagulase-negative Staphylococcus (CoNS) species. 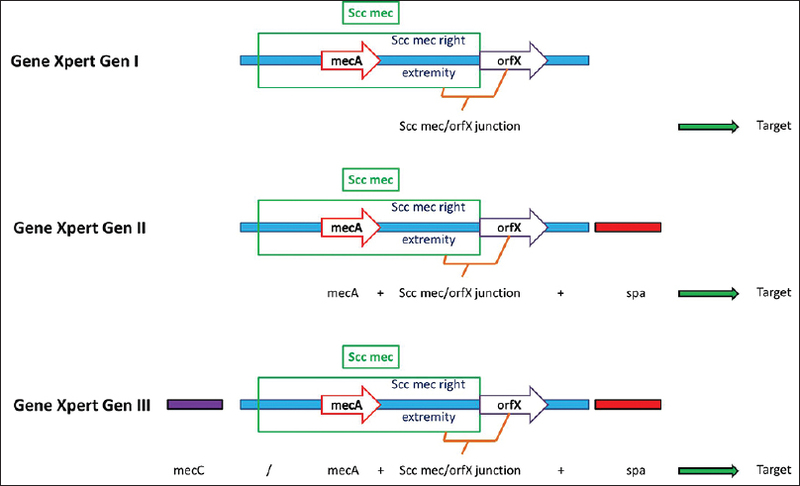 Infection associated with true MRSA or MSSA is differentiated from CoNS, requires target specific primers for the presence of SA and mec A or nuc or fem A gene for confirmation of MR. Recently, livestock-associated MRSA carrying mec C variant complicates the epidemiology of MRSA further. Several commercial rapid molecular kits are available with a different combination of these targets for the detection of MRSA or MSSA. The claimed sensitivity and specificity of the currently available commercial kits is varying, because of the different target combination used for detection of SA and MR. Toxic epidermal necrolysis (TEN) or Lyell's syndrome is a rare, however, life-threatening mucocutaneous disorder with an epidermal detachment of a total body surface area (TBSA) of >30%. It is triggered by an idiosyncratic immune-allergic reaction to a drug, with many possible drugs implicated. Treatment success relies on early diagnosis and withdrawal of suspected/causative drug(s) and supportive care. Clinical evidence for specific therapies is still sparse. It is described a case of Lyell syndrome by sulfonamides for chemoprophylaxis of malaria. 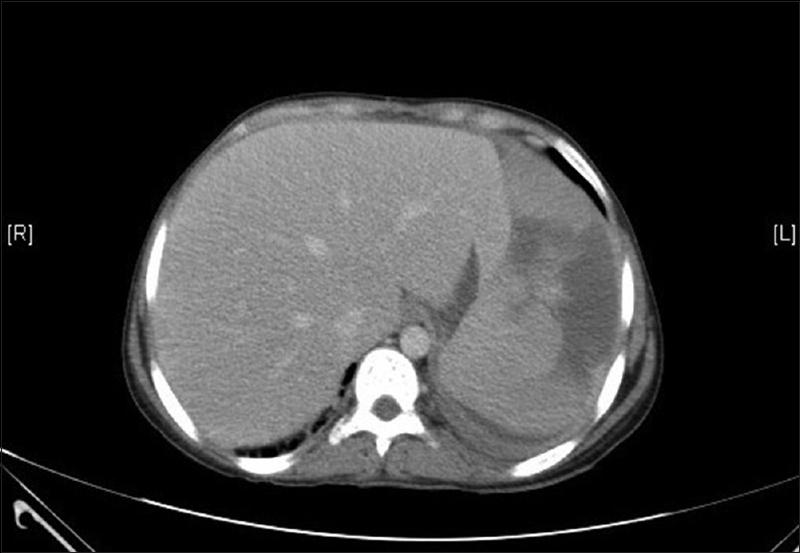 The patient presented with an extensive, rapidly evolving skin detachment, which progressed, despite supportive therapy, involving about 80% of TBSA. This led us to initiate a course of immunoglobulin with good clinical response. The aim of this work is to provide a discussion of the case and simultaneously make a practical literature review of TEN.